Marijuana plants are like any other plants you might grow in your garden. It is possible that sometimes the plants end up with diseases. If the diseases are not treated properly and early enough, then the overall harvest yield is affected. You also have to make sure that your Cannabis Seeds are of good quality. Sensi cannabis seeds are a great choise if you are looking to get the best marijuana plants. For marijuana plants, you can expect them to also have quite the number of diseases affecting them. It all comes down to identifying them and use the right methods to deal with the disease. The marijuana plant diseases are categorized as either fungal or bacterial. The fungal diseases are as a result of the environment being too damp or humid. The bacterial infections on the other hand tend to be hard to notice as compared to the fungal diseases. Let us get to see some of the marijuana plant diseases you can expect to get. As much as cannabis can thrive in nutrient-rich and water environments, so does algae. As a result, there is the need to make sure that they are not sharing the same space. Algae tends to live on the roots of the marijuana plant. This means that the plant gets deprived of the necessary nutrients. As a result, you will end up with marijuana plants that do not grow properly. In such a case, you have to do whatever you can to minimize the occurrence of algae in the area. Always check and clean out algae as soon as it starts to develop. The worst is when you end up with bud rot disease for the marijuana plant. This means that your bud is almost ready for harvesting and it ends up rotting. The worst part is that the infection can often spread quickly. As a result, you need to take precautions to avoid having gray mold on the roots. You are also to keep the temperature within the recommended range so as to manage humidity, which unchecked can speed up bud rot. This is another type of disease common with marijuana plants. 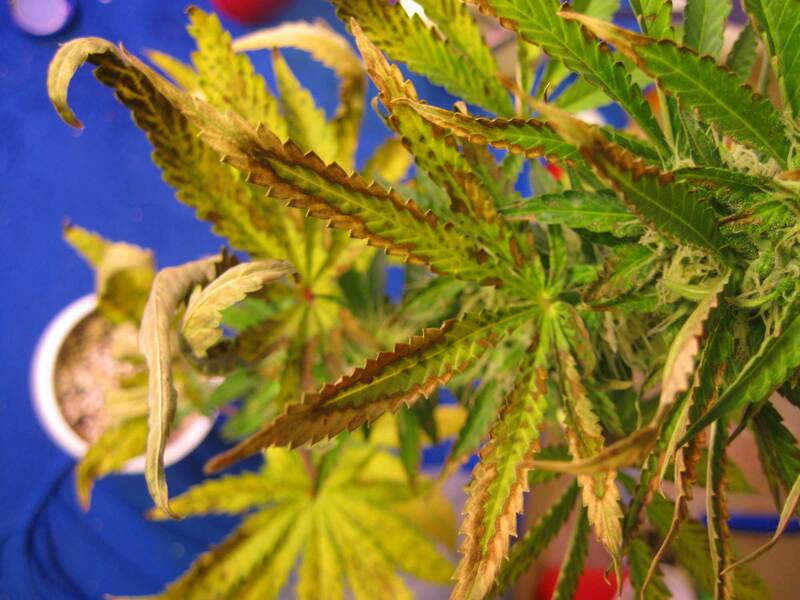 This kind of disease causes yellow spots on the leaves of the cannabis plant. It usually pops up when the plant gets exposed to heat and rain. You will find the yellow spots starting at the lower leaves coming all the way to the top. In some worst scenarios, you can get the entire leaf turning yellow and then this is followed by crumbling. With many leaves being affected, the plant loses most of them and then it cannot survive. With many other diseases affecting foliage, this one goes for the roots. The disease is able to damage the root system, making it hard to get the nutrients from the soil. This condition is likely to lead to more root rot and wilting of the plant. You can often get it being dormant for a while waiting for the right time to strike. So, sometimes it is hard to detect it early enough as it attacks the root system. This is another marijuana plant disease that you might have to deal with. It is a spore based fungal problem that will affect both the indoor and outdoor marijuana plants. The worst is that you can find it being hard to protect against as the spores are transferable through the wind. Well, you can easily see that it is a sneaky fungus that can make controlling harder. This kind of infection can also affect the marijuana plants that are closely spaced. This is because there is limited airflow so movement of the spores from one plant to the other is faster. You can easily recognize it with its white color on the leaves. When left for long, it can cover the plant leaves, making it possible to inhibit photosynthesis. From the name wilt, you can tell how the plant will look like once the disease infects it. For this disease, you get that it strikes in places that are poorly drained or when the soil is overly full of nutrients. The first sign you will see is yellowing and drooping of the foliage. The disease will also make the stem to end up a dark brown color. Well, such conditions can be near impossible to treat. As a result, you might want to consider trying to detect it early whenever possible. From the list above, we get to see that it is possible to get marijuana plant infections at any time. What is important is that you stay vigilant. It helps to detect the marijuana plant disease early enough.